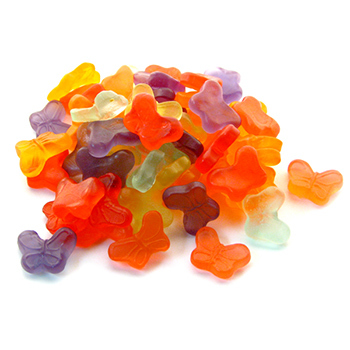 Take flight with a bag of these adoreable gummi butterflies. These gummies are shaped into mini butterflies infused with fruity flavors. Corn syurp, sugar, gelatin, citric acid, lactic acid, sorbitol, natural and artificial flavors, artificial colors FD&C yellow #5, red #40, blue #1, yellow #6, vegetable oil, and caranuba wax. Gummies melt in warm weather!